The renovation work is continuing at our local shops, but that doesn’t seem to be stopping anyone from dropping by for a coffee. The last two weeks I’ve been drawing the machinery on site. 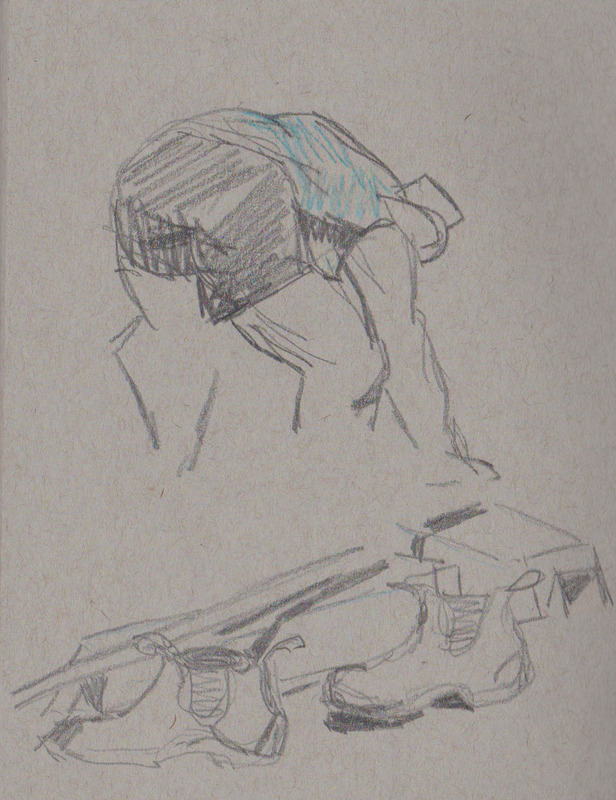 Unfortunately no good figure sketching opportunities have arisen since my previous post on this subject. Two weeks ago I drew the bobcat, which was parked up at a pretty uninteresting angle to where we were sitting. I’m not very excited by this drawing, I could have used the coloured pencils more effectively, rather than just ‘colouring in’. Last week we found a better seat to observe what was going on. Thankfully the small digger that was being used to work on the replacement of the drainage system was parked at a good angle to our table. This time I thought a lot more about how I was going to use my colour, which was probably helped by using the pen for the initial drawing. I kept my drawing loose, which is how I prefer to work. However there was one glaring mistake. I didn’t look carefully enough at the angle of the digger before I started. Had I done so I would have seen that the bucket was actually well below the level of the tractor treads. So now I have a more interesting composition instead, with the bucket tucked in the middle of the sketch. I made my second visit to the Encounters exhibition this weekend past (click here for my previous post). Post knee surgery I was able to take advantage of the Museum’s free electric scooters to get around, rather than relying on my crutches for the duration. This also meant that I had a seat wherever I needed one to draw the various artefacts on display. The day before I went to the Museum I heard a panel discussion about the exhibition on Radio National (click the link to hear the podcast). Towards the end of the discussion Richard West (Founding Director and Director Emeritus of the Smithsonian Institution’s National Museum of American Indian and President and CEO of the Autry National Centre of the American West) discussed his interest in Cheyenne shields. The nub of his observation was that these shields – and probably those of other first nations people – were both intensely personal objects but also representative of their community. This reminded me of a shield in the exhibition that had a hand stenciled on the reverse side. I don’t think it’s too much of a stretch to think that this is almost certainly the hand print of the owner/maker. You can read more about this shield here. I got quite waylaid by some other shields on show, stopping to draw two more. This one is a most elegant design. A slender 16 cms in width and just under a metre long, it is decorated with a series of carved grooves. The grooves change from the vertical to the diagonal, around the middle of the shield and then revert back to the vertical on the bottom section of the shield. As you might be able to make out from my scrawled notes I couldn’t decide whether the optical effect of the face of this shield was enhanced by the use of one or two coloured ochres or not. When I checked the notes it says that pigment was used but doesn’t go into further detail. The other carved shield that caught my attention was covered in bands of diagonal grooves, which really made a dazzling optical effect. In my sketch I used white chalk and graphite to highlight the way the light reflected off the carved grooves, but as far as I could tell there was no pigment on the face of this shield. The light reflections reminded me of the ‘dazzle’ camouflage patterns that were used to distract and obscure ships in WWI. My final sketch of the morning was quite different. It is a marriage ornament owned by a woman which was collected from Mer (Murray Island, in the Torres Strait) by Alfred Cort Haddon in 1888-89. On a series of hand-spun string a series of objects including shells and a variety of other ornaments have been strung. It wasn’t explained whether these were purely ornamental or whether some had a practical purpose. In his catalogue of Haddon’s collections, David Moore (1984:72) noted that the pendants ‘Would have formed part of marriage ornaments worn by bride’. Haddon noted that the number and variety of the pendants was dependent on the wealth of the bride’s parents. ‘They were worn for one or two months before the wedding feast. The older married women also wore many of these objects on special occasions, but never during widowhood’. I think that such an item has a similar symbolic function to the chatelaines, worn by wealthy European women. In my quest to explore some possible new directions in my art I’ve been taking an online class called ‘Stretching’ with the Sketchbook Skool group (and yes they do know how to spell school). Each week a different artist shows you their work, what materials they use and encourages you to try different approaches to making art. 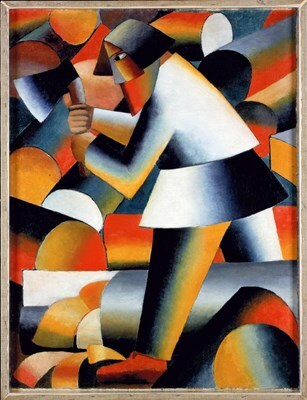 As I am still convalescing this is a great opportunity to put aside ‘work’ for the time being and try something new. So far I’ve really taken to a technique proposed by the ‘mobile illustrator’ Lapin, a French artist who lives in Barcelona. In his exercise he suggests that you draw a portrait where the head of the person (or in this case my cat) dominates the page and the rest of the body is squeezed into the remaining space by whatever means possible. Distortion is encouraged! One other thing, he prefers to make these drawings using a limited palette of pen and ink and three watercolours, Yellow Ochre, Prussian Blue and Alizarin Crimson. You can blend the colours or use them as they come. In this first drawing I used French Ultramarine instead of Prussian blue and I did add lemon yellow for her eyes. I really liked the result I got so the next evening I had another go. This time I did use Prussian Blue, but I find it a bit of a thug in the watercolour palette so my preference is to stick to French Ultramarine. This is my favourite portrait so far. It has captured the serious side of our cat. I would also emphasise that these portraits are not intended to be cariacatures, but are meant to draw the viewers attention to the face. My final sketch did end up looking rather more comical thanI intended. I didn’t get the proportion of the head quite right so this does have a cartoonish feel about it. Of course my cat does have a lighter side anyway. 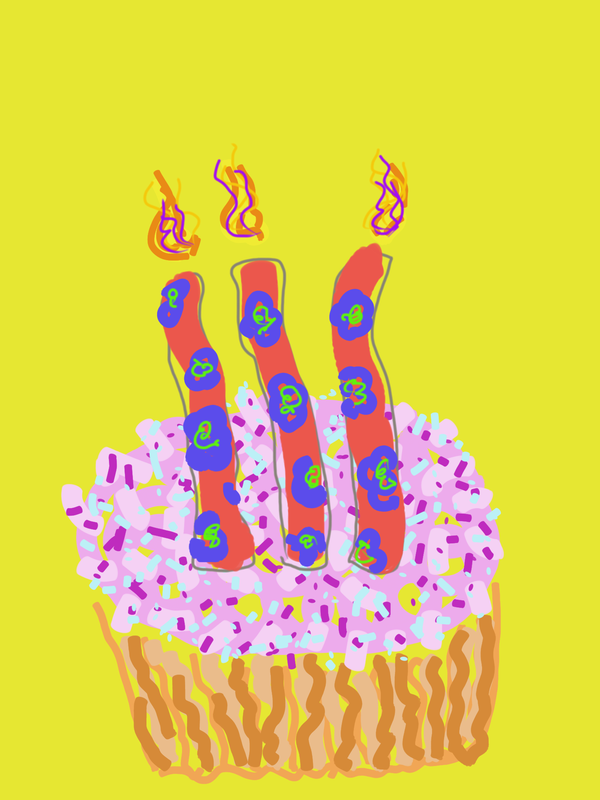 WordPress has informed me that it’s 3 years since I started this blog, so I thought I would celebrate with a virtual cake (so much easier on the hips!). 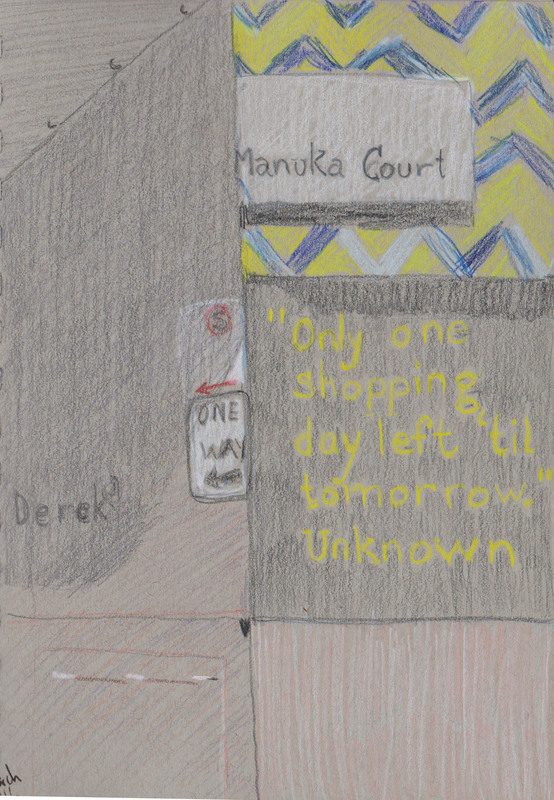 We had a solid roll-up of 12 people at our March sketchwalk, held in the shopping area of Manuka (Canberra’s most up-market retail centre). The cafes were alive with people eating, sipping coffees and catching up with the Sunday papers. 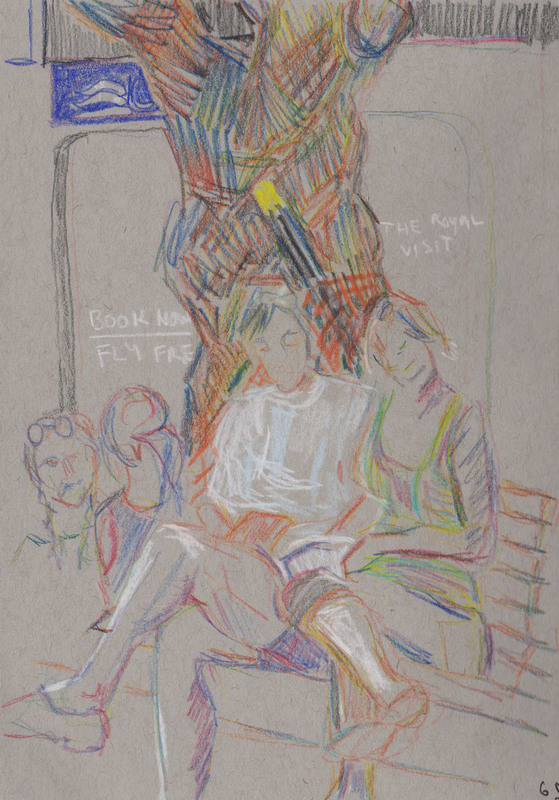 I only had to move a few metres to a convenient bench from where I could draw this couple sitting and reading. They were there for quite a while so I had plenty of time to sketch them. I walked down a nearby laneway where I found some amusing quotations on the walls (tongues firmly in their cheeks). 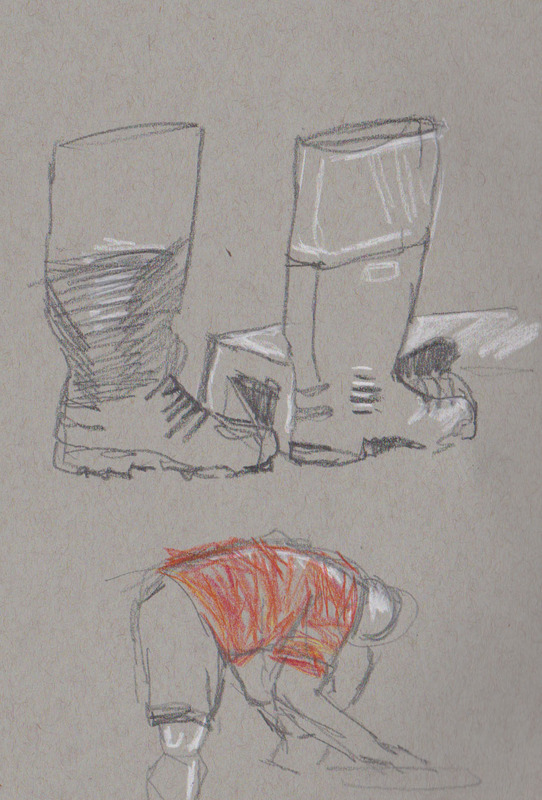 With only 20 minutes to sketch before our meet up time, I did a blind drawing of one of the sculptures on the footpath. Our ‘in house’ photographer spent the morning walking around capturing the crew in action. 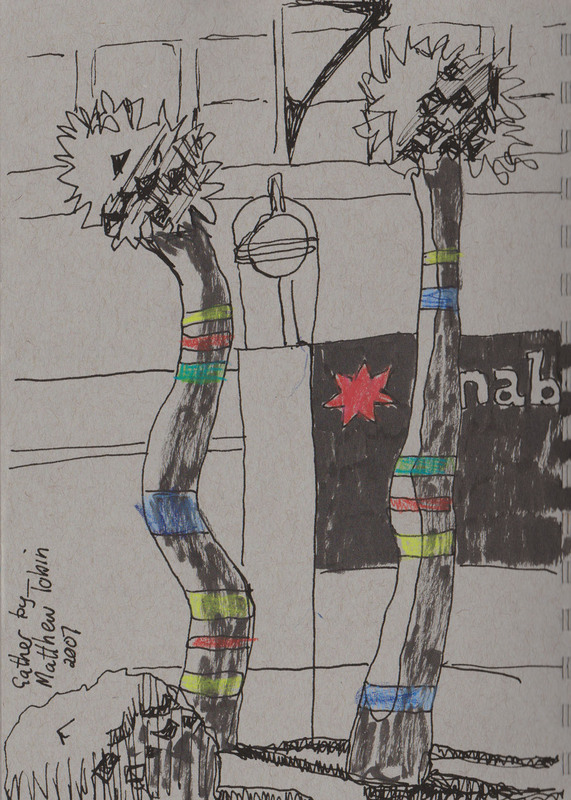 If you would like to see some of the photos or other drawings the Urban Sketchers Canberra Facebook page. In my first post knee-surgery outing (as opposed to doctor’s visits) we went to our local cafe. Changes, by way of a major upgrade of the pavement and landscaping of the shops, are well underway and the dinosaur is on a leave of absence. Instead there was a concreting crew waiting to pour several large slabs which will form the new, level area for seating. Don’t forget to check your pens! You can tell I’m a bit rusty because I made a real beginner mistake – I forgot to check my pens before I left. One was completely out of ink and the other has a dodgy nib that really needs changing. It took a while to get going with the sketches as I fiddled around finding a pencil and approach that I was happy with. In the end I began by focusing in some of the boots that were sitting ready to be used. 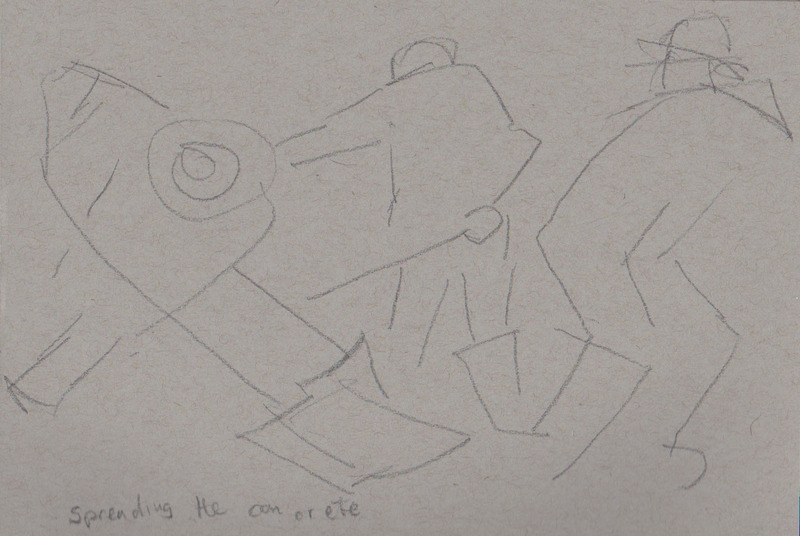 Then the concrete truck arrived and before I knew it I had sketched a group of labourers that Kazimir Malevich would have been proud of. Quick movement as the man spread the concrete. By way of comparison here is one of Kazimir’s. There were several slabs to be poured so I managed to capture the action by loking for the repetitive movements. 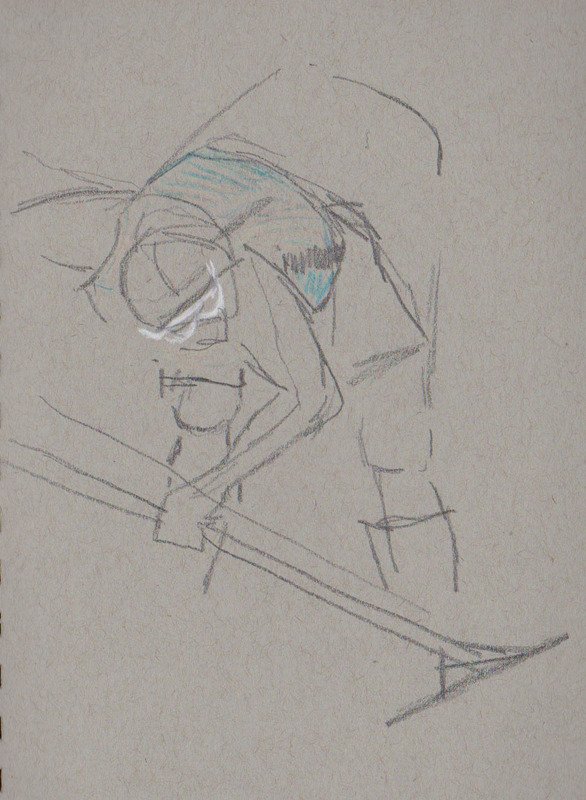 I really enjoyed trying to capture the way the men moved, although clearly bad backs are an outcome of such work.